I would like to make an extra page about the plier used on the Wenger New Ranger knives and this will include some of my thoughts and knowledge about combination tools again. It will be some about advantages and disadvantages. I can assure you that I am only here to be helpful and serious so you may get positive impulses with multi-tools and to receive further factors. I try to write in a way that is not boring to you and I hope I can draw a smile. Some of you are very experienced and can give me knowledge as well. No doubt about it the plier used on the New Ranger knives is a very nice introduction and it is for sure a helpful feature. I do believe the philosophy behind it is an outdoors product with some handyman factors as well. I like it very much. The mechanism on this construction is advanced and I recommend taking a look on it. Because there are springs and an advanced mechanism then it require some maintenance. It is important that it is not abused and used in a wrong way. I do believe because there are springs and this mechanism then there is a limit to the size of the plier and the functionality it can have. Below on the article I will write some links about my pages that are very important that you read because everything is connected. With multi-tools you need to know that it would be very difficult to find any tool with the absolute best functions and one complete tool that can be used for everything. It depends on how versatile you are with the multi-tool and that it is possible improvise. Over the years I have gathered information and knowledge about the tools and I have some knowledge that can be used for benefit. Combination tools are the key to many of the negative factors you may experience using tools and functions. There are differences between a hybrid design and a needle nose plier. A needle nose plier may have different sizes and some are much stronger made than the Wenger type. No matter how slim or strong a plier is you will have to improvise and sometimes abuse the plier. It is possible to avoid any abuse if combination tools are used. If you turn a bolt on a flat surface and the bolt is close to the flat surface in a way that you cannot open it. 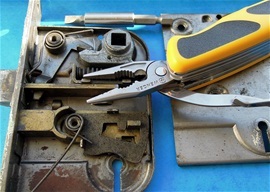 This can be because it is stuck or that you cannot get a good grip with the opening on the plier. This then may mean that the front section of the plier must be used. On a needle nose design this may mean that it will be abused because the tip section is not the strongest at all. It can also be in a situation that the bolt or nut got a screw through it and it is in a position that you have to use the very tip on the plier to turn the nut. It is easy to damage the plier in such ways. It can also be a situation that requires two tools at the same time that would require a combination tool. The plier and mechanism on the New Rangers are made to be a versatile and helpful feature and it is also obvious that it is no impact tool by design and impact could mean abuse. What it could do in an emergency could be very another thing. It is for sure possible but not recommended. It is a very nice tool. It is important with a needle nose design that you read the construction of it and read the object it will be used on. It is important that you take advantage of the design and let the design function as best possible. One of the biggest negative factors with a multi-tool is as simple as getting in a position on equipment or a device. Sometimes it is not possible to turn a bolt because it is not possible to reach it. In most cases then it will not be attempted because you can get hurt or it would require damage on equipment. Today this is no problem really because if you go over everything and think beforehand then it would be possible to prevent this. It is sad that a multi-tool fit most things but I cannot replace the professional tools. I do believe like we know from the world that the use of combination and to build on a tool is used for a long time now. I do believe it is possible to build further on this. I do believe a multi-tool can become much more versatile. It is also important that the use of two separate complete tools can be smart. Here is one more picture of the plier used on the Wenger knife and for sure it cannot compare to the strength of the Swisstools and the ability for harder tasks. There are advantages with the Wenger design and it is spring loaded that makes it very comfortable for fine work and control. 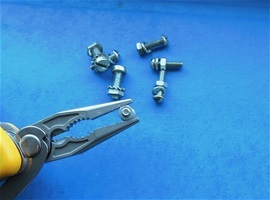 This means that I have used rather many pliers and done different tasks with them. Everyone knows that I like fishing and different hobbies. One can never learn enough and I hope to learn more. There are an incredible number of things that a medium to light duty plier can be used on. Yes this plier can be used on mechanic tasks. The old lock on the picture is dirty and hard to use. The SAK mechanism must be clean and oiled just like the old lock and door mechanism must be to function. Some cleaning and oil then it will be ok again. This is one of the reasons for why my SAKs are clean because this will make the best functionality, quality and durability. Remember with pliers that the gap or jaw opening is a guide to the strength and for what tasks. Maybe some would not agree and there are pliers with a narrow jaw gap for heavy work but for sure the gap is an indication for how much strain should be applied usually. 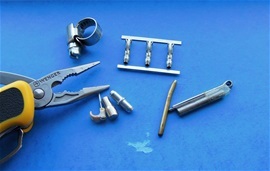 That sad on some applications or uses for connectors that do not require much force then the tip or needle nose can be used wisely. The large size nut can only fit at the front section and usually i do not recommend any force used on this part of the plier. The Leatherman Piranha tool is very good for such tasks! Take advantage of the design on the plier because the angle is such as one flat side can be used and the small cut parts of the jaw can be used for grip and locking. It is obvious that for such tasks it is not possible to apply a secure grip. 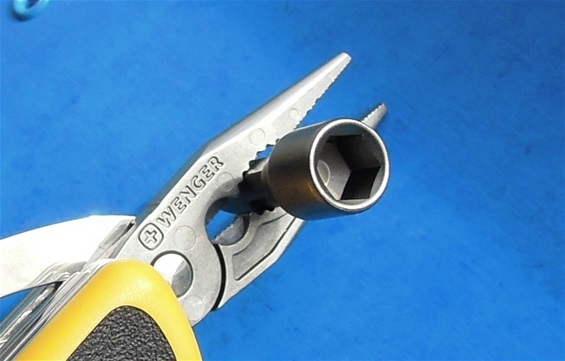 I do like the Wenger plier in deed and it can be used for connectors. There are connectors that are harder and require some force. If corrosion or rust has happened then it is obvious that a combination tool can be used better. The Piranha for example! For fine work the front section of the needle nose pliers can be used with success. It is an advantage with this design for RC hobbies and smaller things. Find the angle or part of the front that coveres most of the nut and turn. In some cases you may need a combination tool in the other hand if you must hold on one side!